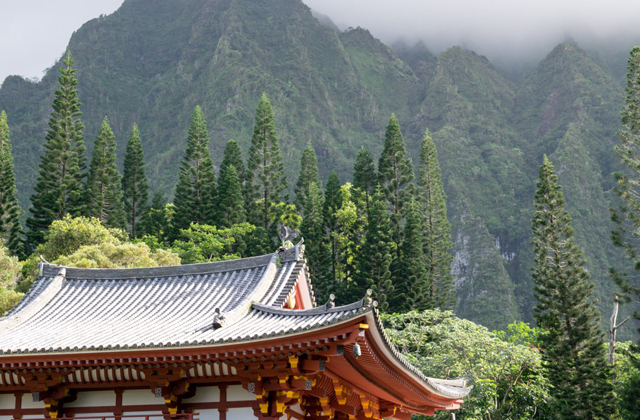 If you want to make the most of a day on Oahu with the ease of a premade itinerary look no further than Hoku Hawaii Tours. They offer luxury tours which allow you to sit back, relax and enjoy your day. I joined the Circle Island Tour, an Eco Adventure conveniently leaving from the central location of Waikiki. After being collected from our hotels in town the day started off perfectly, with a delicious soft pastry. Not just any pastry, these were made from Poi, a local favourite. Purple in colour it’s a root similar to sweet potato. 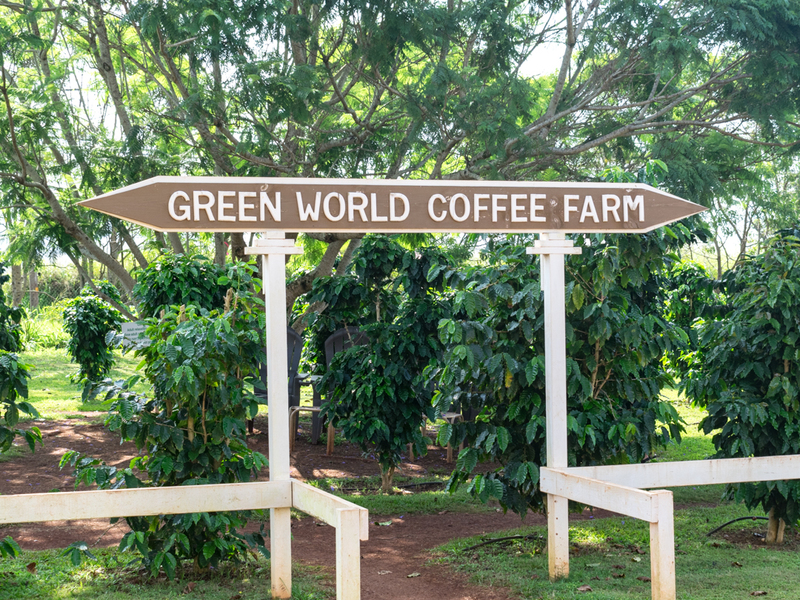 We made our way up the highway to the Green World coffee farm. Walking through the coffee fields made up of over 3000 Arabica coffee trees and sampling the various exotic coffees was a treat. I tasted the “Sexual Coffee”, it was delicious but I didn’t feel any sexier afterwards. I also sampled the “Hawaiian Rocky Road” with rich chocolate undertones. All of their coffee is roasted daily at the farm for the ultimate morning brew. If coffee is not your thing they also have a range of teas to try. With a craving for more I ordered a ‘coffee of the day’ from the attached café to take on the road. Next stop was the Dole Plantation, renowned for its juicy sweet pineapples. We had a wander through one of their eight gardens admiring all of the miniature pink pineapples and our guide explained how pineapples are grown. 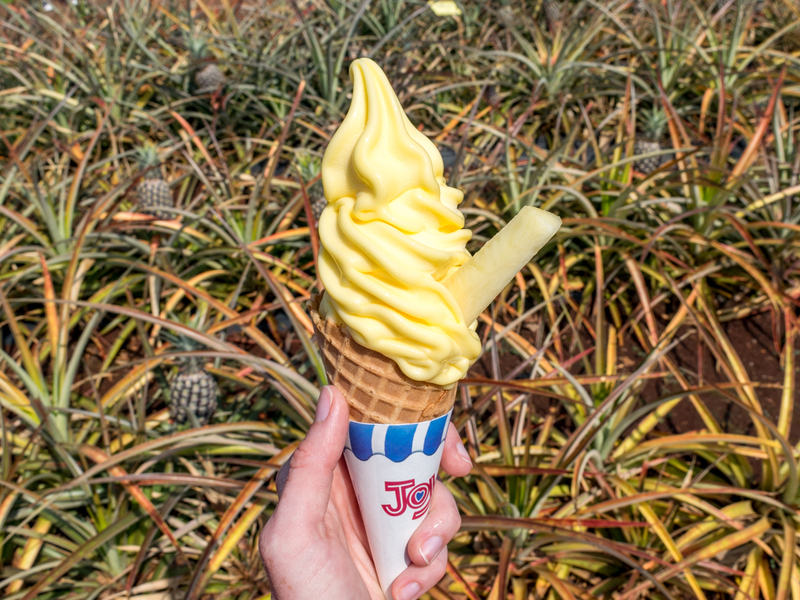 Did you know it takes two to three years for each plant to grow their first pineapple? Our stop at the plantation was planned perfectly. We were first in line for the store opening to get ourselves some of the famous Dole Whip ice cream. I ordered mine in a waffle cone which seemed like a good idea but soon realised a cup would’ve been more sensible. In no time at all the Hawaiian sun had melted sticky ice cream all down my arm. 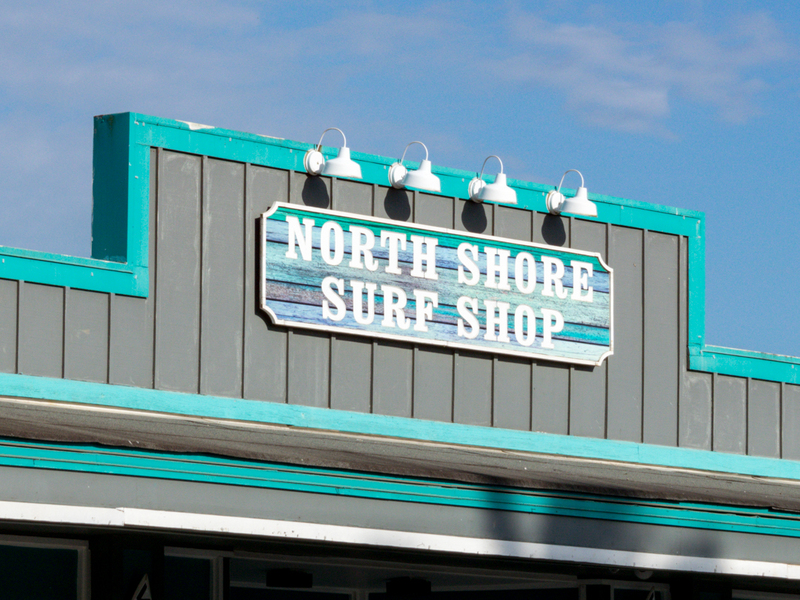 Continuing north, we stopped at the historic town of Haleiwa. We had the option to stand up paddle board, kayak, or take a leisurely stroll through the picturesque town. 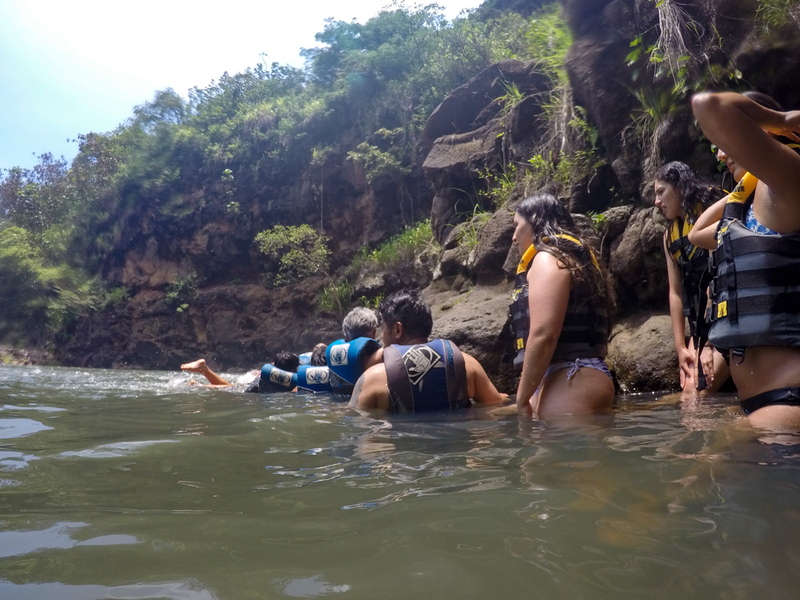 I opted for kayaking on the Anahulu River and really enjoyed exploring and searching for turtles in the bend of the river. I saw a couple pop their head up in the distance but were hiding by the time I paddled over. After using all that energy we were ready for lunch. Preferences were given early in the morning and just like magic they appeared on the shady picnic tables at Tsue Farm. I chose the coconut shrimp which was dished up with a generous serving of rice, salad and a slice of fresh pineapple. I was so full I could barely fit in the pina colada shaved ice afterwards! Satisfied, we rolled back in to the bus and soon arrived at the lush botanical gardens of Waimea Valley. It was an easy 20 minute stroll to Waimea Falls which feels as if you’re in a movie scene from The Jungle Book. Swimming is allowed at this waterfall but it’s mandatory to wear a life jacket. All kitted up we jumped in to the refreshing water and swam against the current up to the falls. Holding on to the rocks so we didn’t float away, we waited until one by one it was our turn to jump off a ledge at the base of the waterfall. Being in the lifejacket was actually a bonus as I could rest on my back and just watch the clouds drifting behind the mountains. As it was a warm day and we had all been good at making it back to the bus on time, our guide asked if we would like to take a swim in the ocean as an extra bonus stop. Looking at the turquoise blue waves shimmer in the sun how could we refuse? We pulled up at Kokololio Beach which was completely vacant. The waves were small and calm so we dove straight in. The water was warmer than the waterfall and was so nice to enjoy what Hawaii naturally has to offer. Heading south we were taught about some past happenings of the island and told stories about the different locations we were passing. We learnt all about Hawaii’s mythology and history. 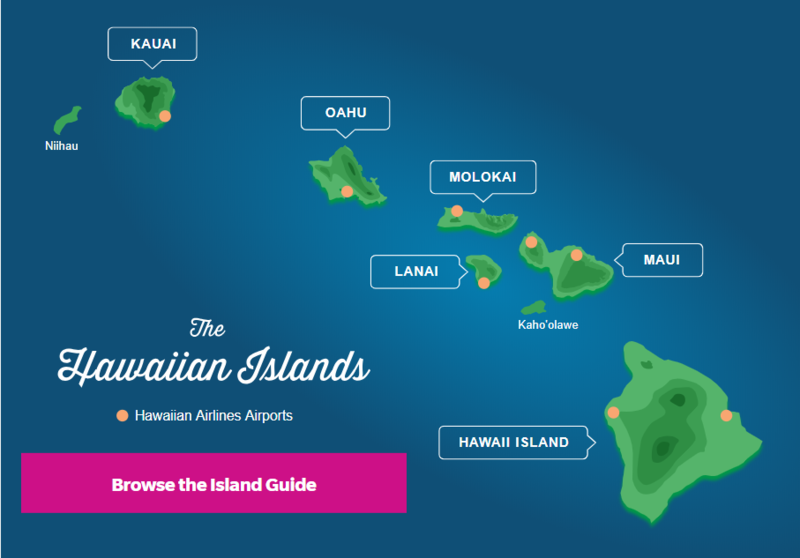 We were lucky to have a Hawaiian bred tour guide who could explain to us the true meaning of Aloha and other cultural differences between our countries. 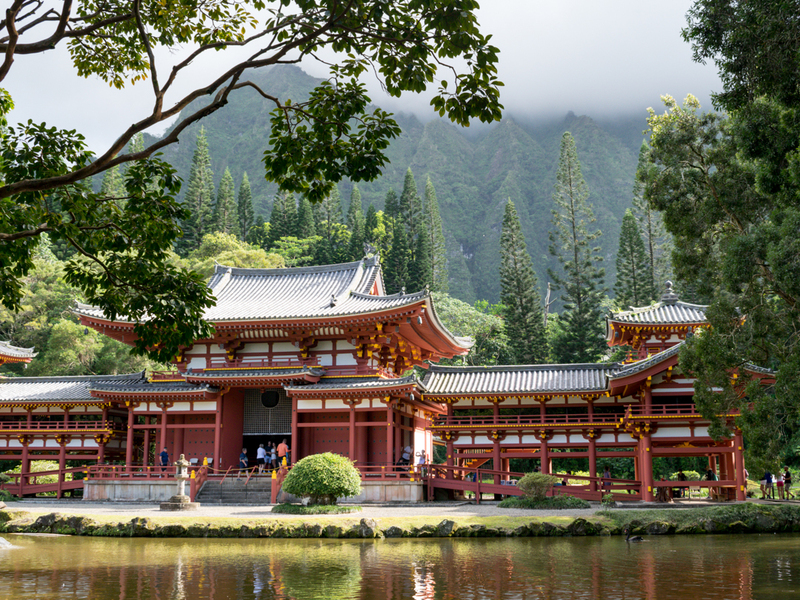 Not long after we arrived the Byodo-In Temple, dedicated to the first Japanese immigrants of Hawaii. The late afternoon was a lovely time to visit as the light reflected off the roof and the water surrounding the temple. On our way back to Waikiki we took a quick stop at the Nuʻuanu Pali Lookout for a panoramic view of the Oʻahu’s windward side including Kaneohe, Kaneohe Bay and Kailua. 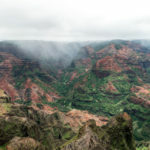 Hoku Hawaii Tours is the new luxury branch of Roberts Hawaii who I joined for an outing in Kaua’i. The day was full of exceptional service in a quality bus. 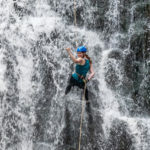 I thoroughly enjoyed the variety of activities and sights, starting at 7am we really made the most of our day and it was a satisfying way to see a good portion of the island. From the bus our guide pointed out locations which I’ve since been back to and enjoyed a whole other day out from his recommendations. 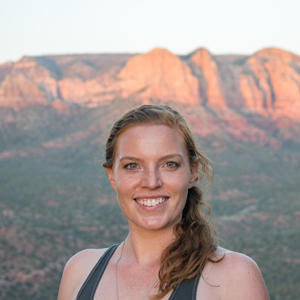 Having a local’s knowledge can make such a positive difference to a holiday. It’s the best way to be immersed in the culture and to find the best local food and sightseeing locations. 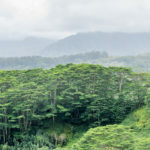 Hoku Hawaiian Tours offer a range of tours on Oahu. Have a look at their selection here.